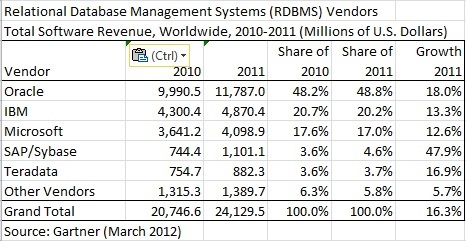 Gartner numbers released late last month show that Oracle has almost half the relational database management system (RDBMS) market in terms of revenue, far outpacing rivals IBM, Microsoft and SAP. As you can see, Oracle’s growth was the largest in terms of raw dollars, and second largest in terms of percentage. The largest percentage growth went to SAP/Sybase, which already has Sybase databases and is trying to ramp up its database business further with the SAP HANA in-memory appliance. But its percentage growth is largely because it was starting from a smaller base. Can SAP really be the #2 database vendor by 2015, as it hopes to be? For that to happen, it would have to at least quadruple its database business in the next four years.